Sky has fought back in the ongoing carriage dispute with Discovery, saying it wasn't prepared to pay "close to £1 billion" for its portfolio of channels - the price demanded by the US factual and sports TV giant for ongoing carriage on Sky's TV platforms. The dispute threatens to make a dozen channels unavailable on the satellite TV service after Tuesday 31st January 2017, including Discovery, Animal Planet, TLC and Eurosport 1 and 2. Following a breakdown in talks between the two broadcasters, Discovery went public on Wednesday evening, encouraging viewers to apply pressure on Sky, by telling them to contact Sky to protest about the changes. The US media giant said it was "committed to finding a solution with Sky." During the day, Eurosport has stepped up its social media campaign, implying that Sky didn't want to carry the channel because it doesn't show enough football. But in a statement issued this evening, Sky made the unusual step of revealing the sum of money involved in a potential carriage deal: Discovery had wanted £1billion for its portfolio of channels, although it was not clear whether that includes carriage in both the UK/Ireland as well as Germany and Austria, where the two companies are also at loggerheads over carriage. It claimed the recent publicity by Discovery, following a year of talks over carriage amounted to "misleading claims and aggressive actions". "We don't boot channels off our platform"
Responding directly to criticism from viewers, Sky said it "doesn’t boot channels off [its] platform. 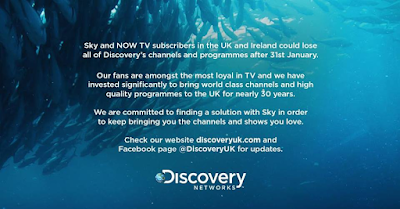 If Discovery don’t want their channels to disappear, as their public campaign suggests, they could have made arrangement to stay on Sky, including free-to-air with advertising funding or with their own subscription, but they’ve chosen not to do so." On Wednesday evening, Sky said the channels "will" be removed from its platform at the end of the month, while Discovery said they "could" be removed, giving rise to allegations that Sky was pulling the channels. Sky is now advising subscribers with the revised wording that these channels are "unlikely" to be available from February. 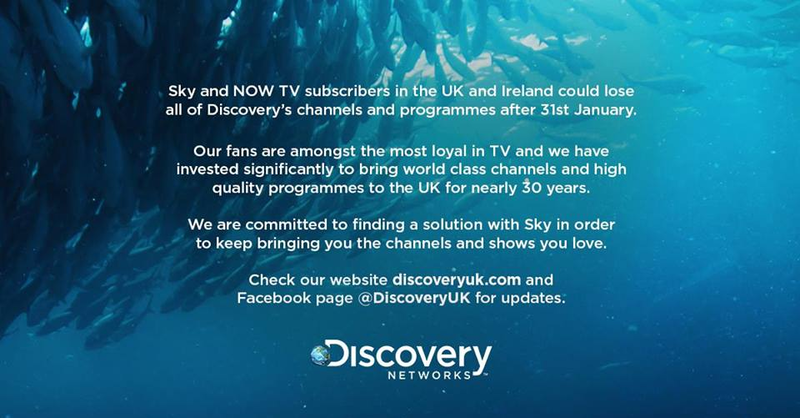 Sky has said it will reinvest the money that would have gone to Discovery in "better content that our customers value". It told customers "this will come from sources around the globe and home grown shows and documentaries from the UK. We will continue to offer customers a huge range of content including hundreds of shows from The History Channel, National Geographic, Sky Arts and Sky Atlantic, along with more amazing sport on Sky Sports Mix, available to all our customers."